The delivery arrived very fast and was well packed. After unpacking I was pleasantly surprised. The two umbrellas looked just as high quality as in the pictures. However, what was most positive for me was the feeling of holding the umbrella in my hand. Sure, it is a bit heavier than an ordinary umbrella of this size. However, it gives you an incredible sense of stability. This was confirmed by a colleague who saw and tried the umbrella. Her first comment was, "It's not just an umbrella; it makes you feel safer just by having it in your hand." I had to think about that and decided to test the umbrella to see what it could really withstand. I was aware that it might not be able to survive the tests and might not be usable. Some may think, "I do not buy an umbrella for 79.00 Euros just to break it", But I did - if I want to trust this umbrella to protect me from physical dangers, then I want to know if it really can. I would rather sacrifice 79,00 Euros than to sacrifice my physical health in an emergency, because I have relied on something that eventually let me down. Again, it was not about destroying the umbrella, but about determining if it is good for self-defense in an emergency. I automatically trusted that it protects from rain. Two days later I started my tests with the City-Safe. For all test scenarios, the umbrella was included in the supplied protective cover. I did not want to test the fabric for its resistance to rusts, but rather the entire umbrella for its stability in the case of defense. 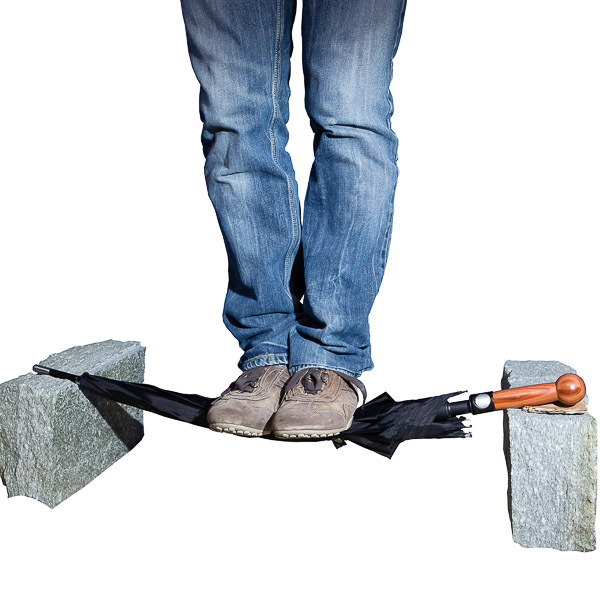 The umbrella was tested on a box dummy, old wall tiles, roof tiles and wooden boards. It was pushed both with the top, as well as with the long side of the umbrella and beaten with the knob. Specifically, my boxing dummy "Bob" was maltreated with this umbrella for 30 minutes in the same way I would do it with an escrima stick. Then I smashed old 20 x 20 cm bath tiles. These were stacked between two trestles. In order to get warm, I started with two tiles, each of which was pierced with the tip and destroyed with the long side and the knob. After each pass I tested the function of the umbrella. I tested until I could only destroy the tiles with the knob and several punches. I did the same thing with roof tiles and various wooden boards. The umbrella then worked smoothly every time. Eventually, I became ambitious to see whether the umbrella would break at a lever use. I decided to pry open a manhole cover. By that I mean a manhole cover with ribs, which can be found on roadsides. First, I tested on another lid, if what I was going to do with a steel tube would be possible. The steel tube was inserted in the middle through the ribs, pressed down at the end of the pipe and the cover lifted on one side. I did the same with the umbrella on the cover in front of my house. The manhole cover lifted to one side and the umbrella still worked afterwards. As a result of my test, I had an umbrella where the shell was destroyed and the knob and top looked as though I had demolished a house; but the umbrella still worked. The point and the knob were still stuck. The umbrella was still easy to open at the end, passed the test with a steam jet and was easily closed again. My conclusion: The Security Umbrella is an excellent self-protection tool. I hope that I will only ever need to stop rain and possibly sun. But when I get into a situation where I have to defend myself, I know that I can 100% trust on this umbrella. This certainty was worth the expenditure of 79 Euros for the test. Here you find his stable umbrellas.